Eight male patients (mean age 75 years) underwent a single treatment session using a variable-pulse 1.5 mm spot size Nd:YAG laser with epidermal cooling. 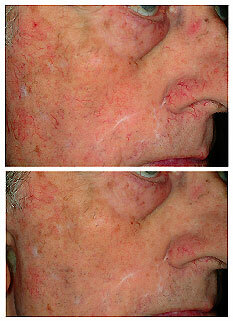 Telangiectasia (broken capillary) diameters were 0.3 to 2.0 mm. Test sites were performed using three pulse widths (3, 20, and 60 ms), with fluences varying depending on vessel size and response. Full treatments were performed using test parameters giving the best response. Thirteen weeks later, the patients returned for final evaluation and satisfaction rating. Fluences ranged from 226 to 425 J/cm2, with smaller vessels requiring larger energies. Pulse duration was equally divided between the 20 and 60 ms settings. The shortest pulse width (3 ms) was inferior in all patients. Longer pulse durations achieved superior vessel elimination with minimal immediate purpura and no postinflammatory hyperpigmentation. The average mean vessel clearance was 26 to 50% in half of the patients and 51 to 75% in the other half as evaluated by three unbiased dermatologists with extensive laser experience. A small-spot size Nd:YAG laser using a pulse width of 20 ms or higher appears to be effective in clearing a significant percentage of facial telangectasias with a single pass. The side effects were minimal. Reviewed: Monday, April 16, 2007.